We generally have a quick tech talk, so you get exposed to some concepts and ideas, limited to your current level. You may have heard them before, maybe in a different form - in which case we'll just reset on the new vocabulary. We'll keep repeating these throughout, usually adding more details and associations and points of view. You'll often be asked to just GET UP and do some movements on the floor, to feel and understand the movements or the relationships we're talking about, the bio-mechanics principles behind the respective movement. We'll show you photos and videos of the end result: what you should do exactly, and what it looks like. And then we'll ask you to explore ON SNOW the movements, the ranges of movements and give you cues and examples to gauge the results yourself. We believe this is the most effective way to learn. As you head out on snow, you'll have a list of what to do. You won't practice all day, we prefer so called technical free ski which is a mix of directed skiing, where you free ski but with a certain focus and drills. So you'll generally be skiing through your improvement as a skier, which will be cool. The drills will help you build skill and balance, which will improve your skiing as you're doing it. It is important to work the drills into your skiing. Don't just do the drills for the sake of doing the drills: it is much more effective if you work them into your normal skiing. After that, every time you do a drill, try to merge the skills that this drill is developing, into your skiing. So, do half a run (10-15 turns) with the drill let's say Drag the outside pole and then transition to regular skiing but keep focusing on that skill in this case counterbalancing over the outside ski. There are internal cues and external cues. Internal cues are related to feelings and are certainly part of your learning and acquiring new movements. We'll point these out to you as we go through bio-mechanics and discover new relationships. While internal cues are fuzzy (feel this and that) external cues tend to be very clear (touch your boots or match your bindings) and give you instant feedback and are preferable because of that. These give you the basic means to coach yourself. Effective learning is achieved via a feedback loop. You will get your feedback from your partner or video, which you can watch yourself. Having a partner is the best approach, he or she can be a friend, spouse, parent, child or someone else working on their skiing. Most of the time you will have external cues to use to measure success and get instant feedback. Having a partner also serves to keep you interested and you can both learn and follow individual pathways, but if you don't have a partner or someone that can either take video for you or give you feedback, you will need to focus on these external cues. Most drills have a sample video or photos of the expected result. Show that to your partner and he or she can watch you ski and give you feedback after you do even a few turns, if you're doing it right or if you need to do it MORE. On green runs and low speed, the partner can even ski right behind you and shout. Otherwise, when acquiring new concepts or ranges of motion, stop every few turns and the partner can tell or signal you. Or take video which you can review in the lift or inside over a coffee. Discovering is better than being fed information. A lot of learning here is via exploration and guided discovery. Read a tech talk, then we'll ask you to try a few things, feel the results and then we'll discuss what that means. You have to play your part and don't just skip to the answers. When you see that discovery icon or questions like What do you think just happened? please take some time to think through before reading the discussion below. Guided discovery does not replace information and explanations, but it is important to discover effects and relationships on your own, especially if aiming for the athletic side of the sport: racing. Modern learning theory holds that we improve not with "just practice" but with focused, purposeful practice we call deliberate practice. There are 3 groups of levels: green, blue, and black - their names kind of gives them away: when you progress through the green levels, it means you can rule the green slopes, can ski them in full control and having fun, in a variety of snow conditions. Each group has three levels: an introduction to the new level, advanced and expert. 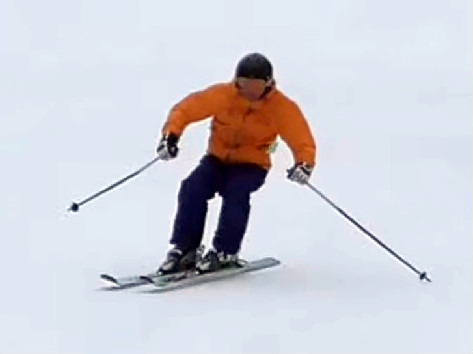 In general, passing the introduction for say blue means you can ski blues in control and more refined technique, with short turns. At the advanced level we focus on the outside ski and carving while at the expert level we focus refinements and performance. The levels are just how we decided to organize the "spiral" through the elements of skiing, but the "blue" level would be roughly where the intermediates would "plateau" - the "giving in" phase of most skiers. The scope of the blue advanced is to get you out of this plateau and, as you progress through the blue expert, you are well on your way towards expert skiing. At the black advanced level you'd be carving up black runs quite nicely, in full control of the speed and turn shape and will be having tons of fun! There is also a special extra level, racing, which is a bit different, we'll get to that. We will keep cycling through the same fundamental technique elements, movements and skills. As you progress through the levels, we will add a little more detail or increase the range of movement or combine movements or complicate the execution etc. By coming back and cycling through the same elements, we speed up learning and avoid getting stuck. If you insist on refining just one skill or movement, often you may get stuck and unable to progress. We will try to avoid this situation by constantly cycling through related movements and skill and balance and range of motion development topics so, even though each level has a different focus, the movements you cycle through are the largely same. You can read more about this approach to learning Spiral Learning. There are a few models for how we acquire new skills, perhaps worth spending 1 minute on the subject. Our "spiral" is organized to cycle through the different skills and their interactions in increasing complexity for quicker skill acquisition. You will often be skiing quite slowly. We often introduce new concepts or movements to explore on the green runs. Again, slowing down practice is the most effective means to acquire new technical skills. The topics are fairly small and focused on one subject, one new idea, one new point of view of something old etc. You can certainly go through one or more topics per day of skiing: as you read them, your "todo" lists grow. You should attempt to do the "dry land" part as you read it rather than later, for a full understanding in the context of the topic. You can certainly defer the "on snow" part until you get on snow. You could think of these topics like "clinics". Take one hour out of your ski day and go to a "clinic" where you focus on one or two topics, re-read them, do the drills, focus on that subject, try to incorporate those skills or movements into your skiing or refine them. Note the Done button below? If you click it, it will mark this topic as having been read and copy all its drills onto your workout sheet. If you instead click the link to the next article, it will nor mark this one as read. If you don't see a Done button below, then you must go to "Progress" in the top navbar and start a pathway. If there is a Next button irlt neans The currebt topic was already completed. At most levels, if you're stuck at that level on some specific issue or just feel like you're not progressing, you could post in the forum asking for help. Also, going to the local ski school and asking for a private lesson would be a good idea. Make sure you talk to the ski school director beforehand and ask for a lesson specific to your needs. Most levels have an "instructor card", listing the elements that you should work on with an instructor, at that level. Each ski school would have their progressions, which may or may not conflict with ours, but to stay consistent, do not ask for something more or less and do not accept something else. You can always show the list to the skis school director ahead of time and agree on what to work on. I have a Done button, not a Next button. Thank you - it is updated now. The button is "Done" the first time you go through a new topic and becomes "Next" afterwards.